In this article, I discuss the misreading of graffiti and misidentification of graffiti writers as part of anti-gang policing informed by broken windows ideology. 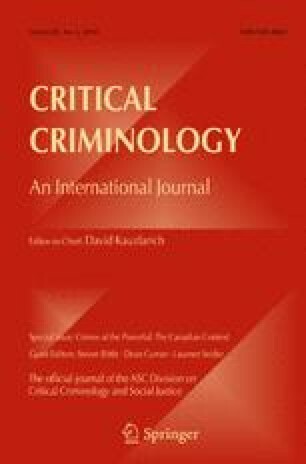 Based on personal observation and autoethnographic reflection, analysis of gang identification protocol, and interviews with graffiti writers who negatively define themselves against gang members as part of constructive identity formation, I argue that relying on graffiti as an indicator of gang activity calls into question the merits and efficacy of anti-gang policing. I situate this discussion within a cultural criminological framework and critique of broken windows policing. Thank you to the thoughtful and encouraging reviewers, editor Avi Brisman, Wisk One, and those critical scholars who have produced the work needed to help people see and understand graffiti for what it actually is, including Joe Austin, Tim Cresswell, Faye Docuyanan, Jeff Ferrell, Kurt Iveson, Susan A. Phillips, Gregory Snyder, Robert Weide, and Alison Young. There is no conflict of interest or competing claims herein. Alarcón, D. (2015). How do you define a gang member? The New York Times Magazine, 27 May. Available at: https://www.nytimes.com/2015/05/31/magazine/how-do-you-define-a-gang-member.html. California State Auditor. (2016). The CalGang Criminal Intelligence System. Retrieved March 5, 2018, from https://www.auditor.ca.gov/pdfs/reports/2015-130.pdf. FBI. (2012). Violent gangs galley. Retrieved March 5, 2018, from https://ucr.fbi.gov/investigate/vc_majorthefts/gangs/gallery. Gelman, A., Fagan J., & Kiss, A. (2007). An analysis of the NYPD’s stop-and-frisk policy in the context of claims of racial bias. Journal of the American Statistical Association, 102(479)[September], 813–823. Available at: http://www.stat.columbia.edu/~gelman/research/published/frisk9.pdf. Los Angeles County Department of Public Health. (2011). Gang Homicides in Los Angeles County 1980–2008. Retrieved March 1, 2017, from http://www.publichealth.lacounty.gov/ivpp/injury_topics/GangAwarenessPrevention/Gang%20Homicide%20Chart%20Apr%2021%202011%20chart.pdf. People v. MTA. (2010). http://clkrep.lacity.org/onlinedocs/2009/09-2135_misc_7-12-10.pdf. Wilson, S. (2012). Los Angeles’ war on street artists. August 30. Retrieved February 21, 2019, from https://www.laweekly.com/news/los-angeles-war-on-street-artists-2176203. Winston, A. (2016). You may be in California’s gang database and not even know it. Reveal. March 23. Retrieved March 10, 2018, from https://www.revealnews.org/article/you-may-be-in-californias-gang-database-and-not-even-know-it/.